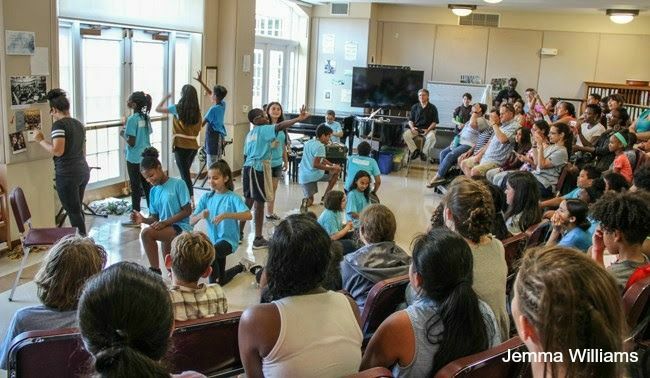 At the end of the summer, Pathfinder parents attended a "Share Fair" highlighting the student work in Mike Calderone's Theater class. Although many students used their time off for traveling, eating, and sleeping, some kids found themselves on Hopkins campus during their summer vacation. Along with the Havre Soccer Camp, Squash Camp and Pathfinder, Hopkins School hosted a total of seventeen academic summer courses for grades seven through twelve this past summer. These programs were available to all students who were looking to explore new courses during the summer. Katherine Takoudes reflected on her time on The Hill this summer: "Although summer school was an intense six weeks of studying, I still managed to have some fun this summer and I look forward to junior year."